The Colorado Division of Homeland Security and Emergency Management (DHSEM) launched the 2017 Colorado Emergency Management Academy on April 11, 2017, with 36 participants from local and state agencies. The Academy is a seven-month program for new and existing emergency managers throughout the State. The academy consists of training opportunities and resident courses that are developed to be Colorado-specific and tailored to show Colorado processes. The academy will provide networking opportunities with emergency managers and professional across the state. It culminates with a week-long resident course with a final Emergency Operations Center based exercise. 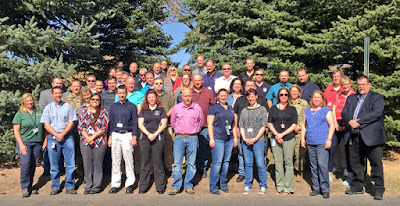 Additional information on the Colorado Emergency Management Academy is available on the DHSEM web site. The 2017 Emergency Management Academy class.